Advocate staff photo by JOHN McCUSKER -- The elevated Interstate 10 through the Treme neighorhood. 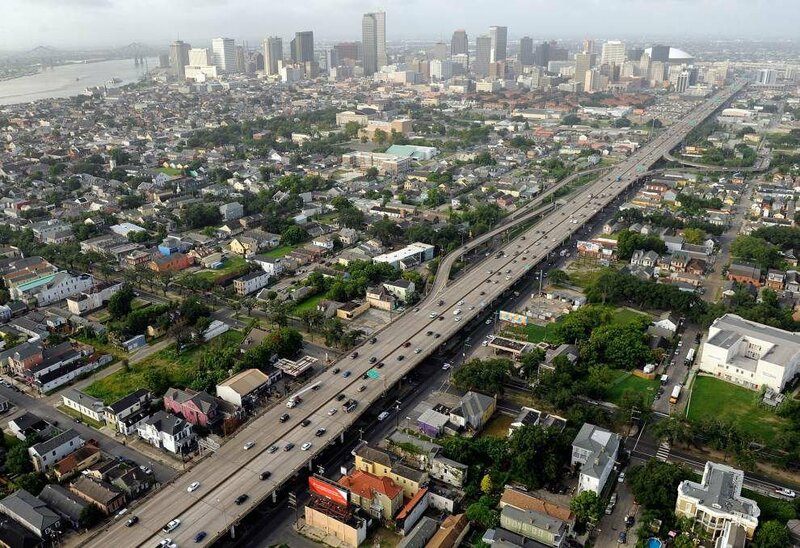 File photos of aerials of New Orleans area and landmarks shot July 23, 2013. The New Orleans metropolitan area is continuing to grow more diverse, with suburban parishes particularly seeing large increases in the size of their black and Hispanic communities in the years since Hurricane Katrina while the black proportion of the population in Orleans Parish is shrinking, according to new estimates from the U.S. Census Bureau. Those shifts are largely in line with national demographic trends. New Orleans’ black community is still 30 percent smaller than it was before the levees failed and is making up a slowly shrinking portion of the city’s population, according to the new estimates. This week’s release is a follow-up to estimates earlier this year that found the region was still recovering some of the population it lost after Katrina, but that New Orleans and other parishes were no longer seeing the same dramatic growth rate as in the years after the storm as residents returned to their homes. Those estimates put New Orleans’ population at 384,320, or about 79 percent of the population it had in 2000, and the seven-parish region at about 93.5 percent of its 2000 level. The Census Bureau does detailed, door-to-door counts of population only every 10 years; it relies on surveys and estimates to track the changes in between. This week’s figures come from one of those estimates, though when drawing comparisons, most demographers prefer to use the 2000 census as a measure of the area’s population before Katrina and the 2010 head count to determine the region’s characteristics in its aftermath. Beyond the significant decrease in the city’s black population, the shifts in the New Orleans area largely mimic national trends: growth in the Hispanic population, increasing diversity in the suburbs and the return of younger, white residents to city centers, said Allison Plyer, executive director and chief demographer of The Data Center, a New Orleans organization that has charted the region’s recovery in the aftermath of the storm. In part because of those trends, minorities now account for about 38 percent of the population of the suburbs around New Orleans compared with 26 percent in 2000. Some of those trends may have been accelerated locally by the effects of the catastrophe, but they mirror what is happening elsewhere in the country, Plyer said. By contrast, the decline in the city’s black population — there are about 97,400 fewer African-Americans living in New Orleans now than in 2000 — is one change that can be pegged directly to the effects of the storm and the recovery. There’s little data on exactly what kept the city’s black population from returning at rates similar to those of other groups, Plyer said. The difficulties of recovering from the flood, particularly for low-income residents who didn’t have the means to fix up their homes or renters who suffered from the lack of programs aimed at non-homeowners, have often been cited as possible reasons. Other economic factors are likely in play, as well. A report by Loyola University found that in 2011, about 52 percent of black men in the city were unemployed. A Data Center report from 2013 found that median income for black households was only about $28,300 a year, about half that of their white counterparts. Ensuring economic opportunity regardless of race will be important for the area moving forward, particularly given the increasingly diverse racial mix in the area, Plyer said. She noted that the white population also decreased in the aftermath of the storm. Across the metro area, there are now about 75,230 fewer white residents than there were in 2000, a loss of about 10 percent of the group’s total population. New Orleans itself now has about 9,000 fewer white residents than before the storm, but, because of the overall decline in the size of the city, they now make up a larger proportion of the population. The city is now about 31.2 percent white, compared with 26.6 percent in 2000, while black residents, who had made up more than two-thirds of the population before the storm, now constitute only about 58.8 percent of the city. That’s smaller than their percentage in any year since 2010. The shrinking of the city’s black population is in stark contrast to most of the suburban parishes in the metro area, which have seen their black populations increase in size. 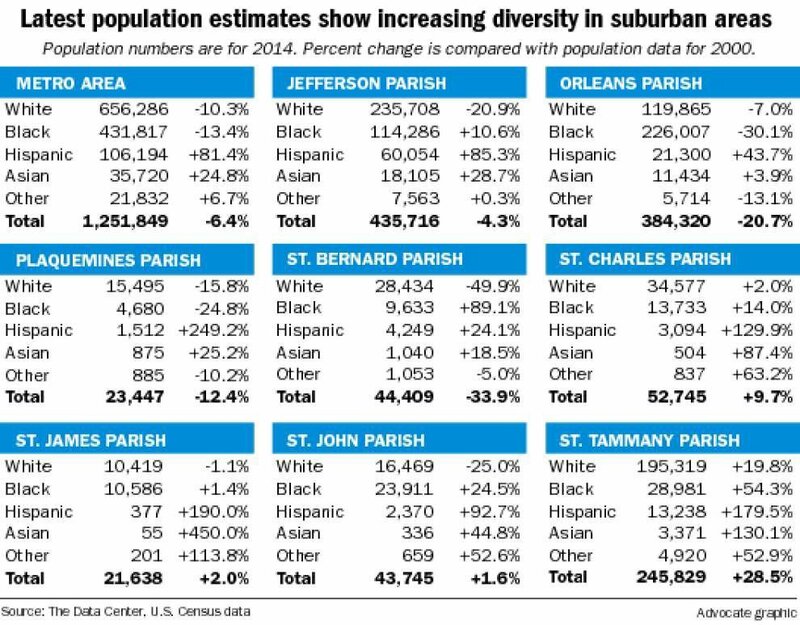 St. Bernard Parish has seen the most dramatic increase, gaining about 4,540 black residents, or an increase of about 89 percent over the community’s population in 2000. St. Tammany’s black population has increased by about 54 percent due to the influx of about 10,200 new African-American residents. But even with those gains, there are still 66,750 fewer black residents in the metro area than before the storm. Other minority groups have grown across the metro region, with the size of every parish’s Hispanic and Asian populations increasing in recent years. That growth was most significant in Jefferson Parish, which has nearly doubled the size of its Hispanic population. That parish now has about 60,050 Hispanic residents, 85 percent more than before the storm. Hispanics now account for about 14 percent of the parish’s population, about double their proportion in 2000. Jefferson Parish also saw the largest influx of Asian residents, adding about 4,000 since 2000. Editor’s note: This story was changed June 25 to reflect that the proportion of New Orleans’ population made up by African-Americans has been shrinking, though the overall number of blacks in the city is growing.